Made in America 2 1/4" wide single layer agitation dog collar with a handle. This beautifully crafted leather collar is built to work. It is the ultimate in strength and function. The built-in handle on this leather dog collar allows the handler to maintain complete control even when the dog is engaged with the decoy. The collar is 2 1/4" in width, tapered to 1" at the buckle, and made from full grain Havana brown Bridle leather with heavy-duty hardware. Perfect choice for large and extra large breeds. Made in America with pride. Firm rich-colored leather with enough oils to withstand weather. Beautiful, great feeling leather, made from heavy native steer hides and drum dyed for deep, consistent colors with waxes and tallows. Hot stuffed with just the right amount of "spew" on the grain and flesh to have that English feel. To ensure a perfect fit, please measure your dog's neck before you order. For further questions see sizing information below. Each Orion Leather collar is custom made to your size specifications. You will be asked to provide your dog's neck size at checkout. We make our buckled collars with 5 holes, so you are always assured a 4� adjustability range on any collar, still it is important to measure your dog carefully for his comfort and your peace of mind. You will not want the collar so loose that is slips over the dog's head or so tight that he can't breathe properly. PLEASE NOTE, we size our collars by NECK SIZE, not overall collar length. Properly measuring for your dog is important, please take the time to read through our measuring instructions, thanks! You will want to measure your dog with a cloth measuring tape or you can use something flexible (ribbon, string etc), and measure it out with a tape measure or ruler when you are done. Do not pull too tightly, or leave a lot of gap/slack. Most people find that they like to adjust their dog's collar per the activity - around the house they have the collar looser, when walking or swimming they tighten it up, this is why we give you a significant adjustment range. A rule of thumb is to leave an allowance for two fingers to fit between the collar and the dog for a comfortable fit. Do NOT measure extra skin, try to get the tape measure up under the flaps, but do not pull too tightly. 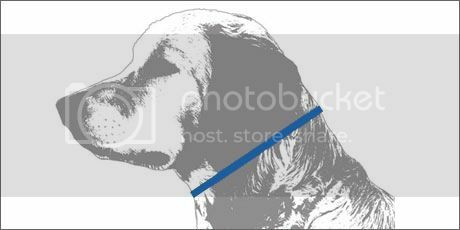 Measure your dog's neck in the center of the neck, as shown in the picture, not too close to the head (collar will be too small) or too close to the shoulders (collar will be too big). There is no need to add inches to the actual measurement of your dog's neck - the size of the dog's neck is the collar size needed. Laying the collar out flat, be sure to measure from where the body of the collar begins to the hole where your dog wears the collar, do not measure the excess buckle or material after the proper hole. If you are measuring a collar with a clip or quick release buckle, be sure not to include the part of the buckle that goes into the other buckle end in your measurement.